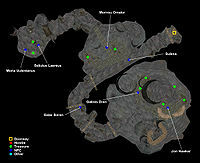 Nammu is a small cave in the Grazelands region to the west of Tel Aruhn. This is one of those caves which may be difficult enough to find at first, but once you've found it, you'll wonder just how you managed to miss it. 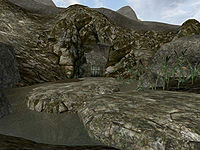 Situated about halfway between the Dunmer Stronghold of Falensarano to the west, and the Daedric Shrine of Yansirramus to the southeast, with Tel Aruhn a little further off to the east, this cave is the eventual destination of a late Imperial Cult quest, to find the Ring of the Wind. It is guarded by a band of six smugglers, one of whom, Galmis Dren, wears the ring. There is also an unusual Redguard prisoner, Jon Hawker, who will ask you for a Scroll of Divine Intervention in order to be freed. The agent Seliulus Laenius provides medium training service in Speechcraft, Light Armor, and Sneak if he is snuck up on or calmed. Redguard Trader Imperial Cult Layman(Layman) 25 230 136 0 30 He is a prisoner here. See Notes. Galmis Dren also wears a Dwemer Cuirass, Dwemer Helm and Bonemold Boots. Bringing a Scroll of Divine Intervention to free Jon Hawker (which turns out not to be his real name) will net two nice unique gloves, Zenithar's Wiles and Zenithar's Warning, and a Reputation Point. Two skill books (Conjuration, Enchant) and four potions can be found lying around. A barrel contains a guaranteed Cruel Shardblade and two Scrolls of Divine Intervention. Other treasure is random but includes weapons, booze, moon sugar and ash statues. Oddly, Mornsu Omalor, the archer, carries twelve bows, but only one arrow. If you stay in dialog with Jon Hawker and continue to give him Divine Intervention scrolls, you'll get additional copies of the gloves and Reputation points.